A new mid-range handset from Lenovo, the brushed metal S660 was launched here at MWC 2014. It slots into Lenovo's developing handset range below the also-new S850 and S660. Lenovo is a massive brand in its native China, but not in the US (and in Europe for phones) and it will be rather interesting to find out what Lenovo will do with Motorola when it take control. And it will be further interesting to see what will happen to its own handset range. Lenovo claims the handset is designed to resist fingerprints which we found a little strange as this model was covered with fingerprints - mind you it had probably been handled by hundreds of people as it sat at the Lenovo booth at Mobile World Congress. The handset boasts a relatively low resolution 4.7-inch qHD (540 X 960) IPS display and comes with Android 4.2 Jelly Bean – featuring the traditional Lenovo overlay - but it may well be upgradeable to Android KitKat when available. The on booth attendant wasn't sure when we spoke to him. The handset comes preinstalled with Lenovo's new app suite including a sharing app to message information instantly between multiple Lenovo devices without network charges, a sync app to handle contacts and back up SMS messages, plus a security app. All the standard Google apps are preinstalled. The handset is powered by a 1.3GHz quad-core MediaTek processor, 3,000mAh battery and boasts 1GB of RAM as well as a microSD card slot for storage supporting up to 32GB cards. As with several Lenovo handsets, there are also dual SIM slots. Camera-wise, there's the almost de rigueur 8MP rear camera and flash in addition to a 0.3MP front-facing snapper. Here is the rear camera in action - the results were surprisingly good for such a mid-range device. 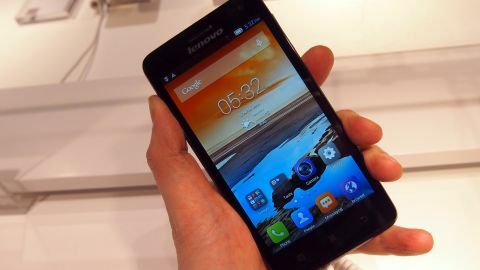 The Lenovo S660 release date is June 2014, but Lenovo is currently tight-lipped as to where its new handsets will launch. The S660 price is $229 (around GBP £138, AUD $256). Lenovo's S Series is starting to see some really fine handsets and, although this won't have the power for many used to high end handsets, it is still more than good enough for less experienced smartphone users.